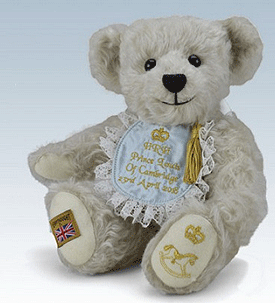 Entirely handmade in England by Merrythought, this luxurious bear has been designed with both teddy bear collectors and Royal enthusiasts in mind. 12in tall, and made from light dove grey, wavy mohair, the jointed bear features cream felt paws embroidered in gold with a delicate crown and rocking horse motif. Around the bears neck is a stunning pure silk bib, tied with a gold tassel and satin ribbon bow. Details of the new Princes name and date of birth will be embroidered in gold across the front of the bib, making this product a unique memento of the nations latest addition to the Royal Family. As a gesture from Merrythought, No. 1 of the Limited edition will be gifted to the Duke and Duchess of Cambridge. Each Teddy Bear is individually numbered on the sewn in label on the bear's left side.